Matt McCarten’s Unite Union is noted for its innovative and determined approach to low-paid workers’ struggles. Now it has a new ally. Doesn’t have a name, so I’ll just call it Cheesy for now, though some are no doubt calling it Nigel. 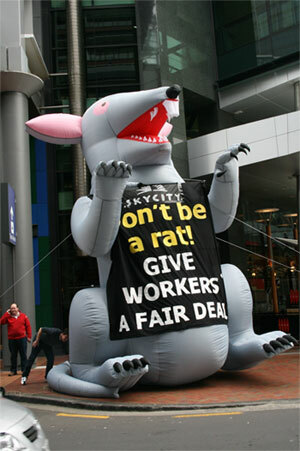 “We wanted to tell the new SkyCity CEO Nigel Morrision not to be a rat and treat his staff decently,” said Unite National Director Mike Treen. It’s the same old story. New Australian CEO thinks he’ll show the kiwi unions who’s boss. Where have we heard that story before? Fast food workers are often vulnerable as they are employed as “casuals” with no fixed hours of work. This allows the boss to punish or effectively dismiss workers simply by reducing or eliminating their hours. Unite is pushing for “security of hours” to be included in a new Collective Agreement with McDonald’s. I heard a McDonald’s Restaurants (New Zealand) Ltd manager on the radio this morning being quoted as saying that many workers wanted the flexibility, but this is not in the on-line report and there is no press release on the McDonald’s site. Anyway, you decide where the truth lies. Update: Anna McM at the Handmirror posts on Chantelle Coup’s victory. a 10-minute paid rest break after having worked for a 2 hour period. after 4 hours, but less than 6 hours, a one 10-minute paid break and a 30-minute unpaid break. after more than 6 hours but less than 8 hours, two 10-minute and one 30-minute unpaid break. Well done to Trevor Mallard and all those involved. Farmers stand up to greedy workers? First off, what the farmers are complaining about is called capitalism, often summed up as “what the market will bare.” Apparently the farmers think that they should benefit from the operation of capitalist market economics, but not workers. Bring back serfdom? If the farmers are going to eschew exploiting movements in supply and demand, I look forward to paying half as much for the next block of cheddar, thanks! Secondly, we are talking about “some”, unspecified number, of workers demanding “up to” $50,000. How about basing alarmist headlines on a some hard facts, Southland Times? Thirdly, as anybody who has completed an introductory economics course can tell you, the demand for labour is derived from the demand for the goods and services that labour is used to produce. Hence the term “derived demand”. Nothing newsworthy here, surely? This is hilarious. As the local union secretary points out, the farmers don’t hesitate to “exploit” the workers every chance they get. Some farmers are having trouble getting workers because of “the way they have treated workers in the past,” he says. These workers work “50–60 hours a week on average over a year.” Federated Farmers is describing the $35,000p.a. going rate as comparable to what university graduates earn. My students in recent years would laugh their heads off at that suggestion. Listen up cockies. You need to start investing some money in the people you employ, just like the CTU says: “This includes decent wages, training, prospects and conditions of work.” Until you do, don’t expect any sympathy if you have trouble hiring NZers to work on your farms. They’re not serfs. Update: Homepaddock comes at this from a different point of view. First off, anybody who has been a regular reader of my blog would have seen posts critical of current research funding (“Frankly, Hodgson is a disappointment”), university funding (“The Government’s response was lame”), finance sector regulation (“Liane Dalziel seems to have dropped the ball”), school funding (“…it appears that [Carter’s] the only person in the country who isn’t aware…”), political blunders (“the symbolic import of ramming more unpopular legislation through Parliament should not be underestimated”), and so on. That’s not hackery, Idiot, that’s independent, critical comment. Care to apologise? And the Nats want to screw these workers? The figures are alarming, and confirm some anecdotal evidence we’ve heard that things are already starting to bite in the ‘secondary labour market’. Basically, to understand what’s been happening in NZ employment relations over the past 20 years you need to understand that there are two ‘worlds of work’. You’ve got the better paid, higher skilled workers enjoying job security and better conditions in the primary labour market, and lower paid workers with crappy work conditions, casual and irregular hours, less job security in the secondary labor market. For the latter, think domestic industry in particular, focussed on cost competition: restaurants and cafes, small shops, rest homes, petrol stations, cleaning contractors, etc. Workers in these industries also have lower rates of unionisation. “The unskilled groups at the bottom of the heap went backwards in nominal terms before even taking the annual inflation rate of 4% into account. And National wants to strip these workers of their protections against arbitrary employers for the first three months of employment, leaving them to their own devices in a declining job market. It took years for these workers to recover from the full-scale assault under Ruth Richardson & Jenny Shipley, with the ECA/benefit stand-downs delivering a fearful left-right jab. Shameful. Postscript: Obviously, the Herald haven’t been to Zimbabwe or even the US recently if they think that we have “rampant inflation”. Rampant Heraldese perhaps? What’s their game? Update: The Standard posts in a similar vein.